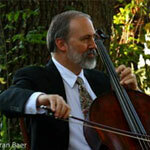 David Kimbell has been well known on Hilton Head Island for many years as a performer, arranger, director and teacher. He plays cello, guitar, violin, bass, mandolin, and ukulele all with equal facility. He plays with the Hilton Head Symphony Orchestra, the Hilton Head Choral Society, the Arts Center of Coastal Carolina, as well as many other venues. David’s string ensembles have a broad repertoire of music in various styles. As a member of the Shore Fire Strings, he’s written dozens of arrangements of non-classical tunes. The group has released an album, “Mixing It Up In The Low Country”, with some sample clips below. wedding. Those pieces may or may not be specified or listed in a program. Hilton Head Entertainment was wonderful! Our ceremony musicians were also wonderful – I have to give a special mention to Dave Kimbell, who played the cello/violin and ukulele - he worked closely with me to ensure that our favorite songs could be played during the ceremony, and he also accompanied a soloist who sang for us. He was very responsive and helpful. And the music was lovely! David Kimbell was fabulous, thanks to you. He was such a gentleman with magnificent skill! He just blended right in. I really appreciate you making this happen! Just wanted to let you know that both David Kimbell did a wonderful job!! He was very professional and great to work with Thanks for all your help Jessica! I just wanted to send you a quick message to let you know that we absolutely LOVED David and his trio for our wedding! They were beyond what I could have ever imagined and created such beautiful ambiance for the ceremony and cocktail hour. Thank you for everything you've done to make our day so special. When it came to wedding planning, music was at the top of our list! Music is extremely important to both me & my husband. We knew it was essential to our wedding day, on 9/1/18. We first came across Hilton Head Entertainment at a wedding expo. Jessica was extremely nice & gave us a bunch of information about the wide variety of artists they have contracted with their company. We had the David Kimbell string duo for our ceremony & cocktail hour. We did not work with him prior to the wedding but booking him through HH Entertainment was super easy. We filled out the forms with our song requests and he executed them perfectly. As a bride, I had ALWAYS imagined coming down the aisle to strings so I am thankful that this dream came true! We took pictures during cocktail hour but I had a few guests compliment on the string duo during their social time. We came in from pictures to them playing "Can't Help Falling in Love" and it was nothing short of beautiful. David Kimbell and his duo were excellent! When it came to wedding planning, music was at the top of our list! Music is extremely important to both me & my husband. We knew it was essential to our wedding day, on 9/1/18. We first came across Hilton Head Entertainment at a wedding expo. Jessica was extremely nice & gave us a bunch of information about the wide variety of artists they have contracted with their company. I did not immediately reach out to her because we were ideally looking for a band. We quickly realized that most of the big brass bands were out of our budget. I reached out to Jessica via email, still not sure about a DJ. She passed along Craig Edelson's information & we were impressed. He has music software that allows you to build a playlist that suits you. After still being unsure, we arranged a phone call with him. We immediately clicked with Craig and knew that he understood our taste in music. We booked him the very next day. My biggest concern as a bride was that no one would dance. That did not happen with Craig! He had the dance floor going all night long. Towards the end of the wedding, he let me DJ a song which was one of the highlights of our night. (Aside from getting married, lol) So fun! Craig's dance floor lighting & uplighting really created a beautiful, cool, fun atmosphere for our reception. I cannot recommend Craig Edelson enough.